The HA123 Test Stand tests all Cummins PT pumps including the high flow KV12 and KV16 types (with an optional adaptor kit HF016). The HA123 Test Stand also incorporates features that enable A.F.C. pumps and pumps fitted with aneroid valves to be tested. To comply with latest standards, the flowmeters are calibrated to the current Cummins test oil specification. Testing Cummins PT pumps on the HA123 is simple and fast. 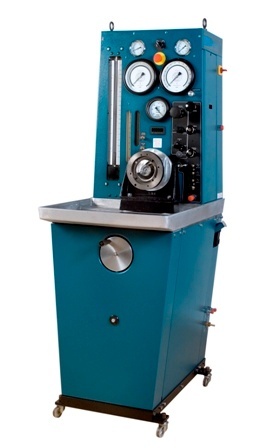 Everything about this test stand has been designed for operator convenience and speedy testing. The digital, easy to read tachometer, flowmeters and gauges, together with close control of the test oil temperature ensures accurate test results. The HA123 Test Stand is supplied complete with all the necessary attachments to test the great majority of Cummins PT pumps. Maintenance is easy, the filters and test oil can be replaced in a very few minutes, there is only one greasing point. PT™ is a registered Trademark of the Cummins Engine Co.